The Christmas and New Year holidays are fast approaching. This brings along with itself bundles of holiday shopping sprees; after all there are gifts to be bought, dinners to be planned and, of course, seasonal décor. Since you really cannot escape these sprees, shopping over and above the holiday budget becomes inevitable; however not for the wise. If you are a little careful and clever, you are not going to end up breaking the bank while indulging in holiday shopping. There are numerous approachable ways with which you can save money. An average consumer has at least one or more smart gadgets now. There are numerous really useful Christmas apps out there that can be downloaded onto the phones and tablets easily; these Christmas planning apps and gift planner apps help you in keeping track of your budget and help you save money. You will be constantly aware of how much you have spent already and how much more you need to spend. Furthermore, these apps are designed to also compare prices of same or similar items from online and actual stores so that you don’t pay more than you have to during holiday shopping. 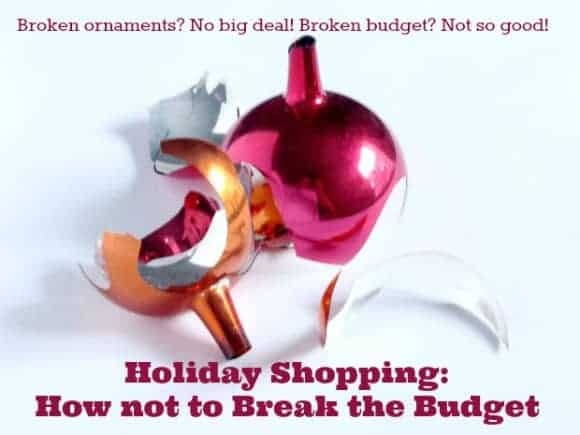 One of the best ways of staying within budget and that will help you save money over the holidays is not spending a fortune on seasonal décor. There are tons of natural stuff, especially in winter, that can be used to brighten up the house. All that is needed is little creativity and perhaps some objects lying around in the house that can be recycled. For example, use salt dough to prepare Christmas tree ornaments and leaves and twigs to spice up those old pots or glass vases. Revamping the house by using and recycling will really help you save money during holiday shopping. Do your holiday shopping online for gifts for children and adults. There are many deals and seasonal sales going on this time of the year that will encourage you to save money. Utilize them to buy the stuff you had thought you would; there is no need of stepping into colorful and decorated stores where temptation might get the better of you. Online coupon codes might also be extremely helpful in holiday shopping and it is also a great way to save money. Making gifts at home instead of purchasing them is a good way to save money. For example for the adults in your family you can make your famous cranberry sauce or apple sauce and pack them up neatly in glass jars that can easily be decorated by items found in home. Therefore save money by being creative and not by indulging unnecessarily in holiday shopping. Last but not the least, the best tip to save money over the holidays, is making a shopping list always so that you go and buy only the things you need. 5 Activities for Toddlers with High Energy Wear Them Out in Style! I find getting my shopping done early before its a mad dash I stick to the budget better. No panic. The hardest part is just deciding what to get. I agree, that is one of the hardest parts! So many great ideas out there, and it can be easy to go over budget when you get into the “just one more gift, this is too good to pass up” way of thinking. These are great tips. We start our Christmas Shopping the day after Christmas. lol. That is when everything goes on great clearance sales. Then we watch the sales racks all year long. That lets us collect a great supply of Christmas and birthday gifts at a fraction of the cost. Normally we don’t take advantage of Black Friday because it’s far too chaotic for us, but this year we did because the deal was too good to pass up on the family gift. This year we wanted to get something that the entire family can enjoy; and use to spend time together. So that we got on black Friday, but that was it. Everything else we shopped online for or used Clearance racks throughout the year. I’m glad you found a great deal on Black Friday! Sometimes it’s worth the madness, but typically, I avoid the rush and crowds. It can get really overwhelming! Great advice, especially doing your shopping online. Not only will you save money, but you won’t get all worn out standing in long lines. We love shopping online. I think you can find deals that are as good, if not better, than those on Black Friday or big store sales. We are keeping things pretty basic for our kids and not spending too much. They get so much from our family we don’t need to go wild too, only to end up with more “stuff”. It is spending time together that is most important, not how much you spent. That’s a great lesson to teach kids early on, it’s the togetherness and family time that matters most during the holiday. All great tips! Being able to give great gifts and not break the bank is so important. Love savings and deals and often shop WAY earlier (as in Boxing Day! Haha) to get sales for gifts for the following season. Wow, you DO start early! That’s awesome! Where do you keep everything so you’ll remember it’s there the next year, but doesn’t get seen by the kids throughout the year? I always buy Holiday decor items after New Years – usually get savings of over 75% so I never spend a penny of my Christmas budget on decor. These are great tips. I really need to start planning better instead of waiting so long to find gifts! Planning ahead is good, but then you can find some really good deals by waiting until the last minute too! great tips! I love being able to save as much money as I can any time of year. Thank you! Saving money is important all year long. Of course, it’s a little harder during the holidays!